The extract from is from the film Star Trek Into Darkness (Director J.J. Abrams, 2013). See YouTube clip below. We are in San Francisco, the time is the future. Khan has just crashed the Vengeance (a space ship) into the city causing considerable damage in an attempt to destroy Starfleet headquarters. Spock has beamed down to give chase while McCoy discovers that Khan’s blood may save Kirk. 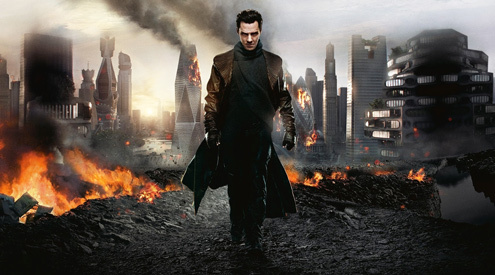 Khan - A genetically engineered superhuman given the alias of Commander John Harrison, he is being chased. Commander Spock - First Officer and Science Officer on the USS Enterprise. He is half Vulcan, half human. He is beamed down and is chasing Khan. Bones McCoy - Chief Medical Officer on the USS Enterprise. He discovers that he can save Kirk’s life. Captain James T. Kirk - Commanding Officer of the USS Enterprise. He initially appears as dead. Nyota Uhura - Communications Officer on the USS Enterprise. She beams down and helps Spock fight Khan at the end of the sequence. Lieutenant Dr Carol Marcus - Science Officer on the USS Enterprise. She is helping Bones save Kirk’s life.